A new version of PartsTrader announced Tuesday adds new features that would benefit repairers — assuming insurers like elephant-in-the-room partner State Farm are willing to play ball. PartsTrader, to use its own reference, has three masters as well: suppliers, insurers, and repairers, and the new software has features for all three. For repairers, the big changes are what PartsTrader said were a redone Quote Selection Tool, the ability to audit your staff and greater aid for developers to mesh it with whatever management system an auto body shop uses. A webinar Wednesday by product manager Lucy Smith elaborated on some of the changes. Whether you love or hate PartsTrader, any user who missed it probably should check out an encore Thursday at 3 p.m. Eastern. Register here. Also, find out about more webinars for repairers and suppliers here. PartsTrader has several scheduled this month for different levels of familiarity. Again, whatever side of the fence you fall on about the hot-button product, a repairer should be informed about it. The revamped quote tool was demoed Wednesday and has already been tested out at actual shops. “We’re getting some great feedback from people that are testing it,” Smith said. The webinar Wednesday also demonstrated filtering results by part source (OEM, recycled, aftermarket, etc.). “As a buyer, I’m in control of the purchase decisions,” Smith said. But not really. As with the AudaExplore, CCC and Mitchell estimating databases, just because you find a result you like doesn’t mean the insurer will like it. While they still can’t see your margins under the new system, they can still see the list prices for the parts and OEM or non-OEM status, raising the same disputes over part quality and price as always. That’s certainly not exclusive to PartsTrader, though No. 1 State Farm’s mandating the program for direct repair program shops does bring the program to the front line of the controversy. The parts themselves fall into a variety of categories as before. 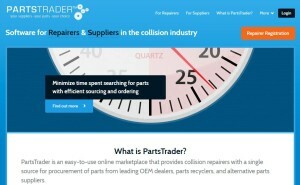 PartsTrader business developer Vice President Dale Sailer said PartsTrader had a lassiez-faire approach to what falls into each category — for example, what defines a surplus OEM, reconditioned part (By a manufacturer? By a third party?). One can understand PartsTrader’s desire, like eBay, to let the marketplace force out lower-quality products and companies rather than try to regulate everything. But that still will make life difficult for repairers who don’t know what to expect from the various categories as well as open the door for insurers to insist on a cheap part with no idea of what they’re getting with the low bid. The auditing feature was requested particularly by multi-shop operators, though it can be used by a single independent shop as well. “It works with one branch as well as many,” Smith said. It allows an auditor — who must have a separate account, as their access is purely read-only — to see what a parts buyer has been ordering. It seems to avoid increases in cycle times by ensuring parts get requested at a steady clip and your buyer isn’t just surfing the Web. Lack of integration with shop management software had been cited as a frustration during a panel at last month’s Atlanta Collision Industry Conference, and Smith said PartsTrader now made it easier to integrate the system — which already had been designed with CEICA BMS — through application programming interfaces (APIs). She urged shops with custom-built management software to “have your developer call us” as well those using a more standard system. “We’re very excited,” she said. One new addition for suppliers might concern repairers — the ability to see which insurer is requesting the part. Smith said it was particularly requested by aftermarket suppliers. “They know that insurance companies are friendlier for one part than another,” she said, referring to how close a part needed to be an OEM original, a sore subject being raised in lawsuits from numerous states’ shops. While preventing a supplier, repairer and insurer from wasting time with parts that aren’t going to be accepted being proffered for the queue, it also seems to provide the temptation for “What will the insurer let me get away with?” rather than “What’s the best part I can send?” mindsets. New filters will also allow suppliers to ignore requests for parts they don’t sell — as well as see chances for growth with parts no one else is selling either — and staff performance and bidding. (In case they missed an opportunity. )Quoting with one’s actual inventory integrated into PartsTrader will beginwith the Hotlines Automatch system for recyclers and expand to integrating the DMI platform of OEM suppliers, according to PartsTrader. 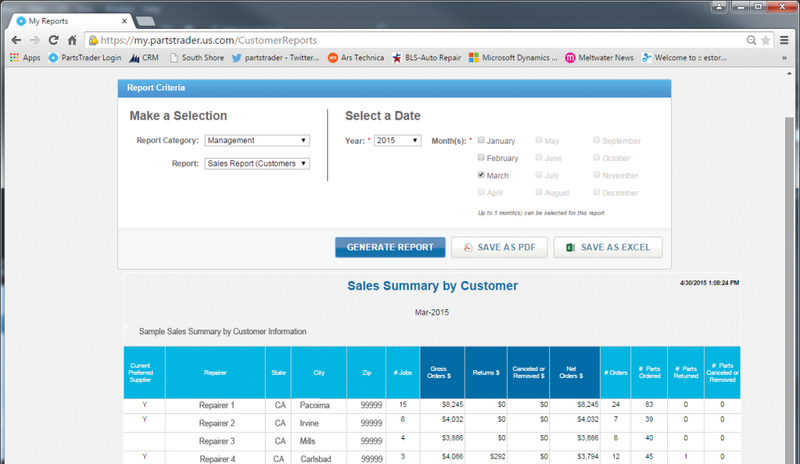 “The new Hotlines AutoMatch feature in PartsTrader 3.0 is a huge time saver! Responding to repairers’ quote requests is now quicker than a telephone call, and we can quote even more parts because we get the entire parts list,” Ryan Mandell, manager of the Graham, Wash., branch for B&R Auto Wrecking, said in a statement. His location was a pilot system.